South Korea and Japan have welcomed a move by the United States to redesignate North Korea a state sponsor of terrorism in order to put additional financial and diplomatic pressure on the totalitarian government. 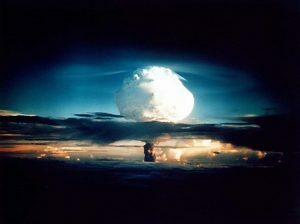 The US Congress is supposed to appoint a new EMP commission, but we will see what happens to it. What has been happening to Puerto Rico should show Americans that the USA can be without power a long time. And Puerto Rico is relatively small compared to the continental USA. Since then, the North Koreans have demonstrated that they can launch ICBMs into outer space–plus it seems to be able to ignite a hydrogen (fusion) bomb. To put it bluntly, an emp attack could harm the USA and ultimately make it more susceptible to be taken over during World War III. Designating North Korea as a state sponsor of terrorism does not reduce its risk to use emp weapons. Donald Trump, Warmongering, and the Red Horse of War Various Europeans believe that Donald Trump has been ‘warmongering’ related to North Korea, Iran, Saudi Arabia, Afghanistan, and elsewhere. They believe that Europe must lead and that the US President must learn from Europe. Jesus spoke of a time called the “beginning of sorrows” that included wars and rumors of war. Are we in the time of sorrows now? Could the red horse of the apocalypse be about to ride? Did the old WCG teach this was a future event in 1985? Does this ride start before or after the start of the “great tribulation”? What does the Bible show? Is Satan involved in this? What about Armageddon? How will all of this end? In this video, Dr. Thiel addresses these issues and more. This entry was posted on Tuesday, November 21st, 2017 at 6:30 am	and is filed under Prophecy.